Common Ground strives to make wellness available and relevant to all Charlottesville residents – both in our downtown studio and out in neighborhood venues or at events. We feel everyone can benefit from massage, acupuncture, yoga and meditation, but many have never experienced them or cannot afford regular visits. We rely on practitioners like you to achieve our mission. Become part of the Common Ground community and be supported by a network of peers. We encourage our volunteers’ and practitioners’ wellness by offering you unlimited monthly yoga at our downtown studio. Auricular acupuncture offers many benefits for public housing residents, homeless individuals, Hospice patients, veterans, and caretakers. Common Ground’s Outreach Acupuncturists go out into neighborhood venues to bring complementary health care to people who deserve it. In our Community Acupuncture clinic, paid practitioners treat multiple people in a comfortable, communal setting, rather than in a private room. We provide reclining chairs, a table with natural linens and other supplies. Therapists work with diverse clientele who pay a sliding scale rate based on their income level. For public housing residents, homeless individuals, Hospice patients, veterans, and caretakers, massage is much needed source of stress and pain relief. Our Outreach Chair Massage Team goes out in neighborhood venues to bring complementary health care to people who deserve it. Take in great music while providing chair massages behind the scenes for festival artists and staff at area events, including Festy and Lockn’. In exchange, you benefit from free access to the festival for that day and other amenities. Employee wellness is good for the health of the whole business. Corporate clients hire Common Ground to provide chair massage services for their staff on-site. Therapists are compensated for the talents. Clients and paid practitioners enjoy the well-appointed massage room at our downtown studio. We provide natural linens, bolsters, massage cream and other supplies. Therapists work with a diverse clientele who pay a sliding scale rate based on their income level. In addition to individual healing, community healing is a part of Common Ground’s mission. When hosting public outreach meditation sessions, leaders provide education about mindfulness principles and simple techniques that can be applied in one’s personal and community life. Thankfully the seeds of education about mindfulness are taking root. Students appreciate the meditation sessions – guided or silent – offered in the Common Ground studio. Leaders are needed for workshops, classes and drop-in sessions. Help us bring yoga to public housing residents, homeless individuals, veterans, underserved children, caretakers. Common Ground’s Outreach Yoga Teachers literally meet students where they are, in their neighborhood venues to offer classes that reduce physical and cultural barriers. Common Ground provides yoga sessions at area festivals like The Festy Experience to promote wellness and as outreach to new populations. In exchange, you benefit from free access to the festival and other amenities. Employee wellness is good for the health of the whole business. Employers hire Common Ground to provide yoga classes and mindfulness learning for their staff on-site. Teachers are compensated for their service. 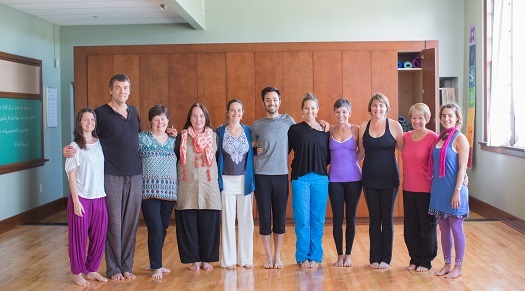 The Common Ground yoga studio is a renovated classroom, with natural light, high ceilings, a sound system and high quality mats and props. Paid teachers work with a diverse set of clients at drop-in classes or through class series. Clients at drop-in classes are offered the classes Pay-What-You-Can $5-$15. Clients for class series are offered the series Pay-What-You-Can $5-$20 per class, and the series is paid for in advance. Common Ground is currently working on growing our yoga program at different community locations. These community classes will be offered on a payment range of $5-15 and participants will select what payment is right for them.